How Do Air Vent Wind Turbines Work? 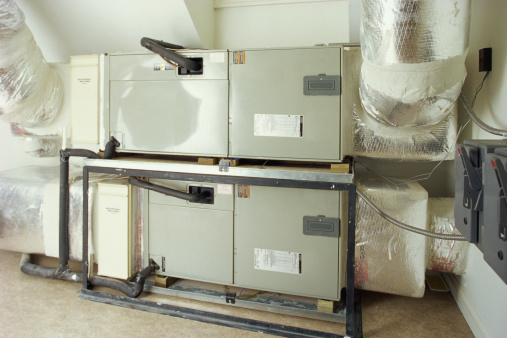 These devices rotate to pull out hot air in warm months and moist air in cold months. They are commonly located in an attic, using only wind and pressure differences as their power source. Air vent wind turbines range in price from $25 to $55. They are advertised to offer energy savings and comfort with low up-front cost. They can be purchased at most hardware stores and online vendors and are commonly either 12 or 14 inches in diameter. The blades or vanes are shaped to allow for maximum wind catching ability, resulting in rotation at minimal winds speeds of 5mph or lower. Installation is generally done at high points on the roof of a building and is relatively simple with each device normally coming with instructions. They can be braced internally or externally depending on the kit purchased. Air Vent Inc. recommends two turbines for up to 1300 attic square feet, three for 1800 and four up to 2400 square feet. The effectiveness of these and other types of attic vents varies based on climate and specific roof/attic dimensions. The concept behind wind turbine vents is that the turning blades will help force air out of the attic. Hot air naturally rises, so if attic air is heated above the ambient air temperature a vent will allow the less dense hot air to escape. Commercial uses of wind vent turbines often connect very large fans to the underside and are used to draw things such as smoke out of a building. A domestic venting turbine does not have this fan. A problem often cited with typical ridge vents is that they stop the rise of this hot air with the inverted V that sits on top of the vent. The effectiveness of wind turbine vents compared to other venting techniques is debatable. A 2002 study from the American Society of Heating, Refrigerating and Air-Conditioning Engineers, Inc. (ASHRAE ) found that "enhanced ventilation (i.e., ridge vents,turbines or a power fan) in addition to soffit vents produced less than 3% reduction in daily cooling loads for test houses." The same study, referring to the effectiveness of venting in reducing cooling loads and moister states, "other strategies have been shown to have a stronger and more direct influence." While they do not discourage the use of venting in all situations, it should be used as part of an overall air flow strategy. Writing professionally since 2008, Don Shepard has been published in a water resources laboratory manual and in various online publications. He holds a Bachelor of Science in meteorology from Ball State University. His most recent work includes performing editing team leading duties for a prominent political advocacy firm.